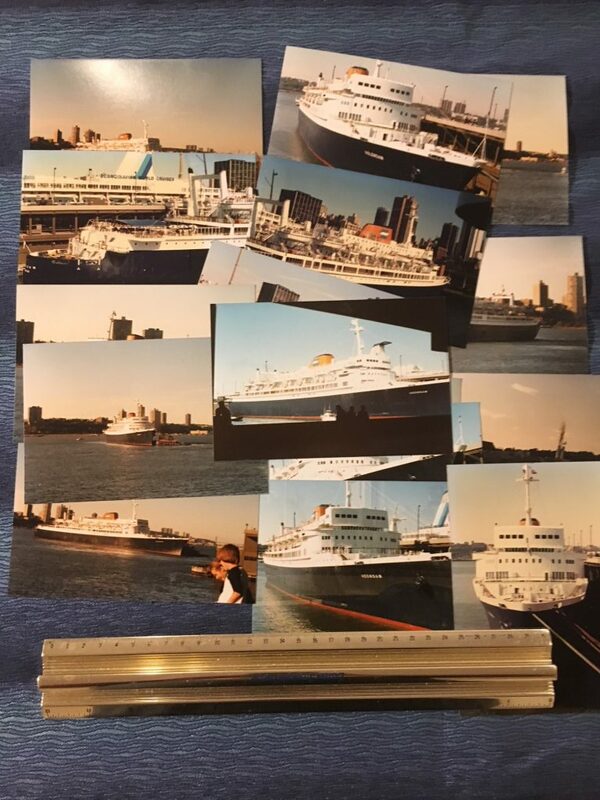 The Spotless, Viking and 3 Crown fleets. 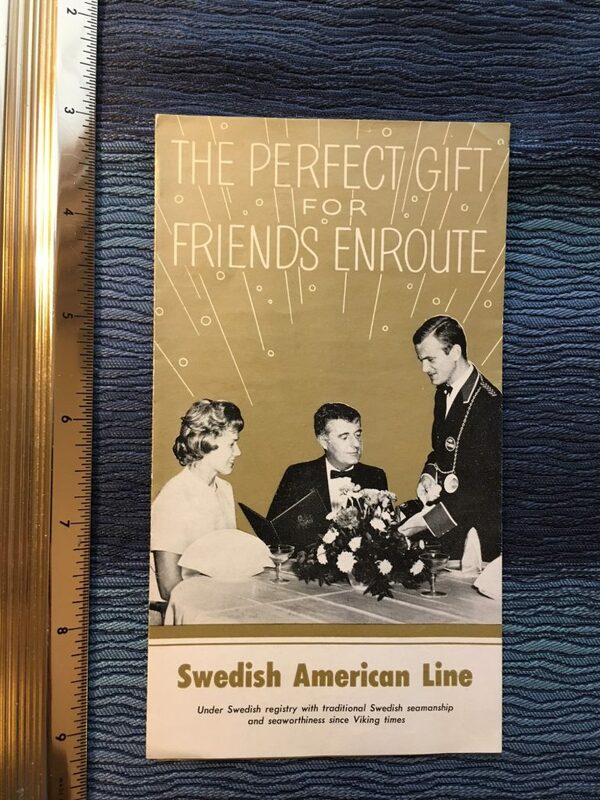 Great little brochure offering landlubbers the opportunity of buy their friends traveling at sea a bottle of Champagne or Burgundy. 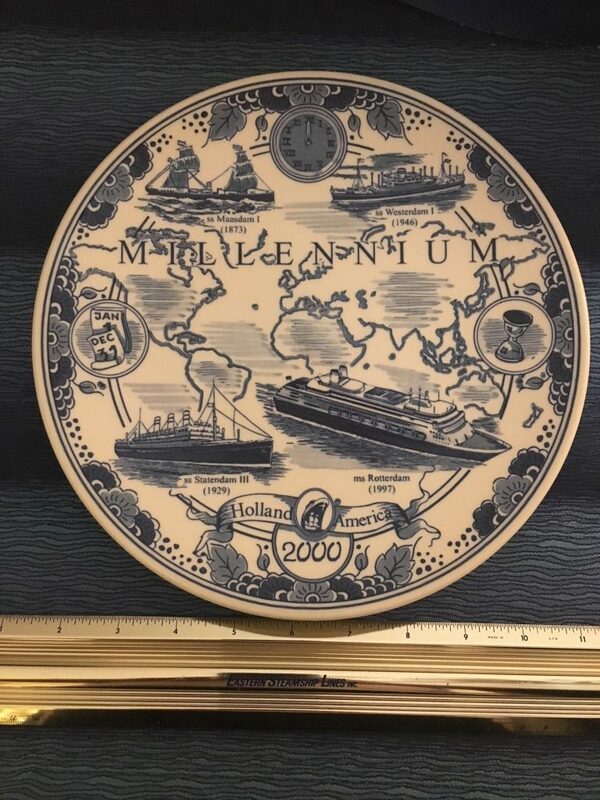 Unusual little item. 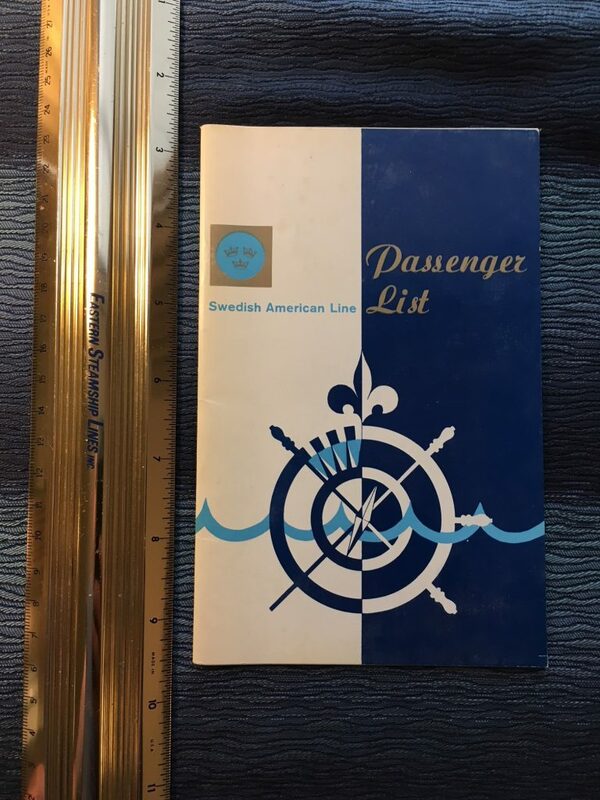 Nice mini fold out for the 1966 cruises offered by SAL’s Kungsholm and Gripsholm. Excellent condition. Nice little cabin plan for passengers .. nice little fold out with simple plans amd several interior photos. Excellent condition. 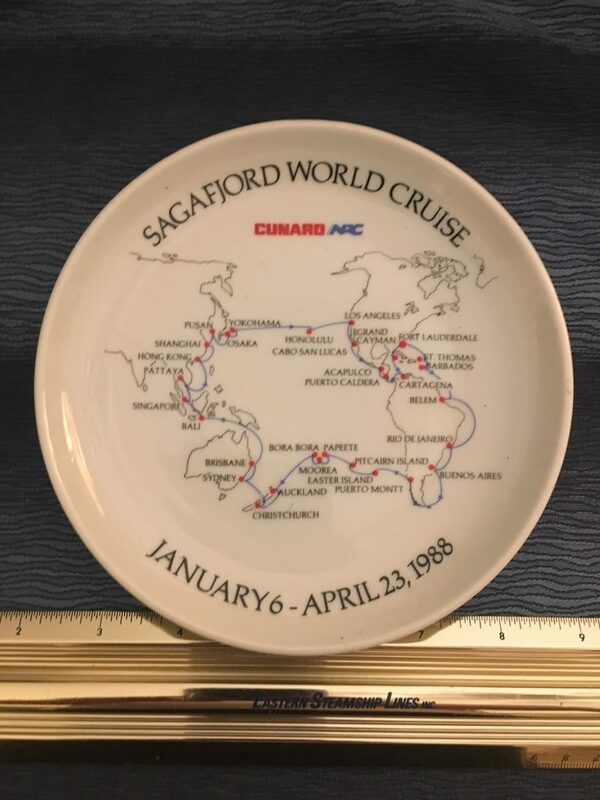 Nice little souvenir plate for the lovely Sagafjord’s world cruise dated Jan-April 1988. 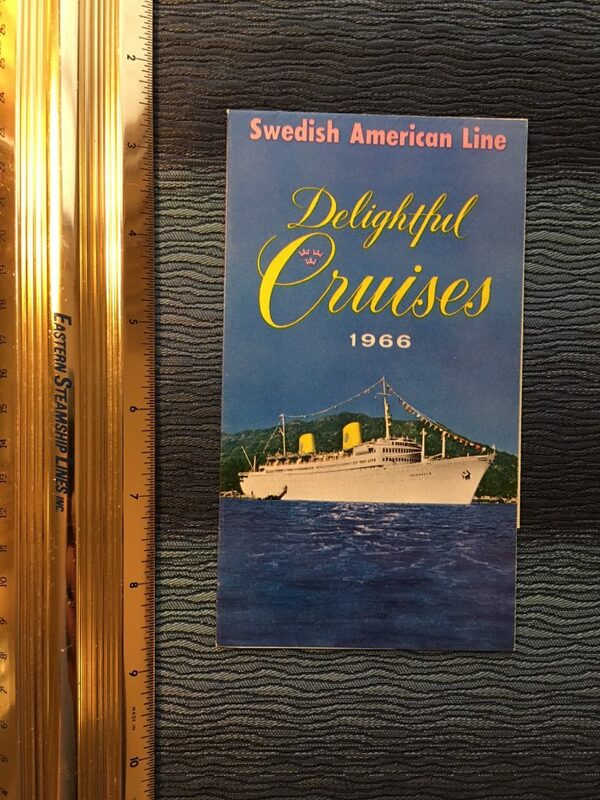 Super nice condition … I would have been about a year out of high school during this cruise. 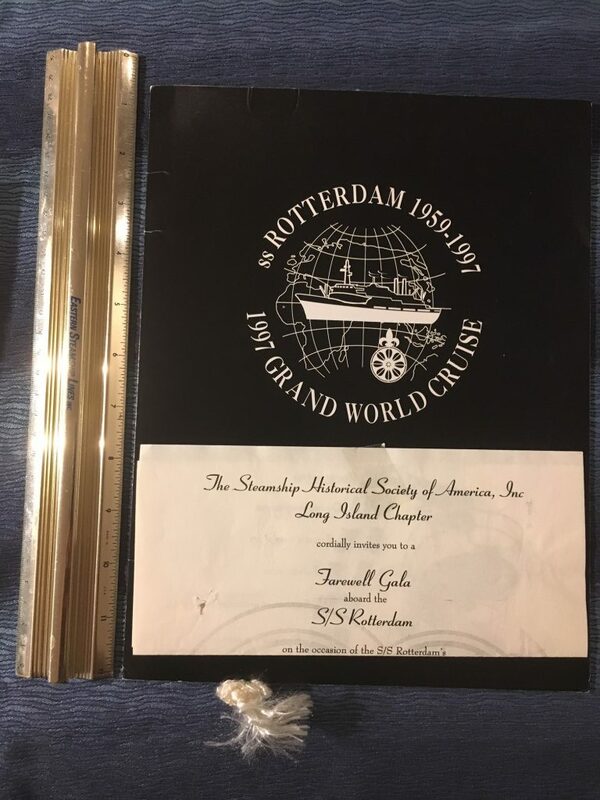 She would have been jointly operate by NAC and Cunard at this time. 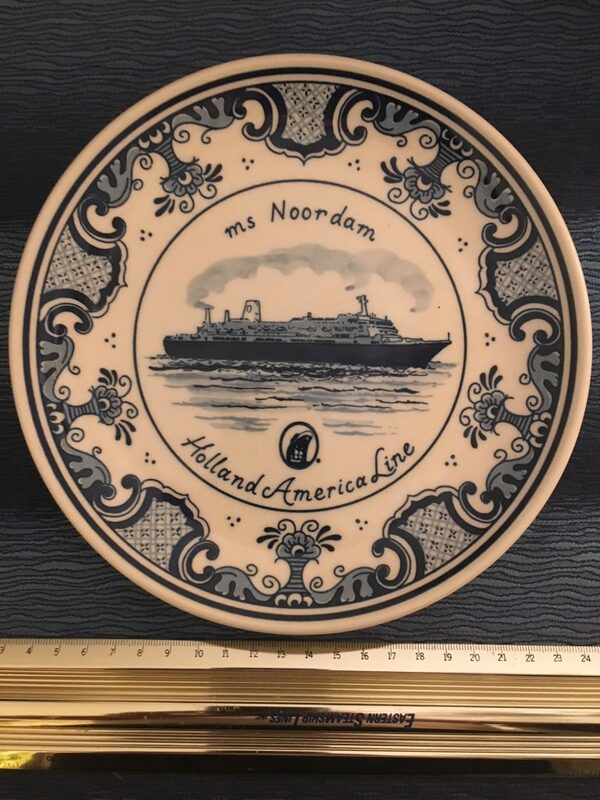 Gret Tin form the HAL Noordam. In very nice clean condition. 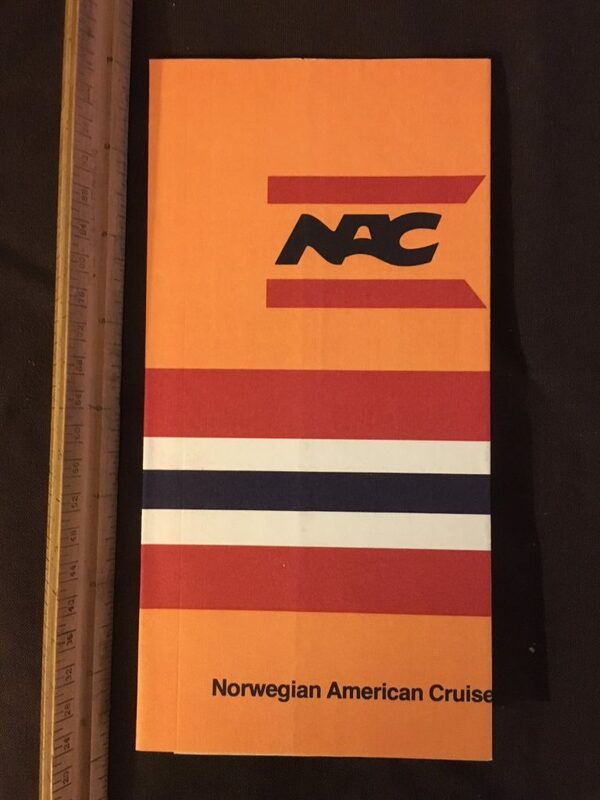 HAL: 1969/70 Mod Cruise Guide. 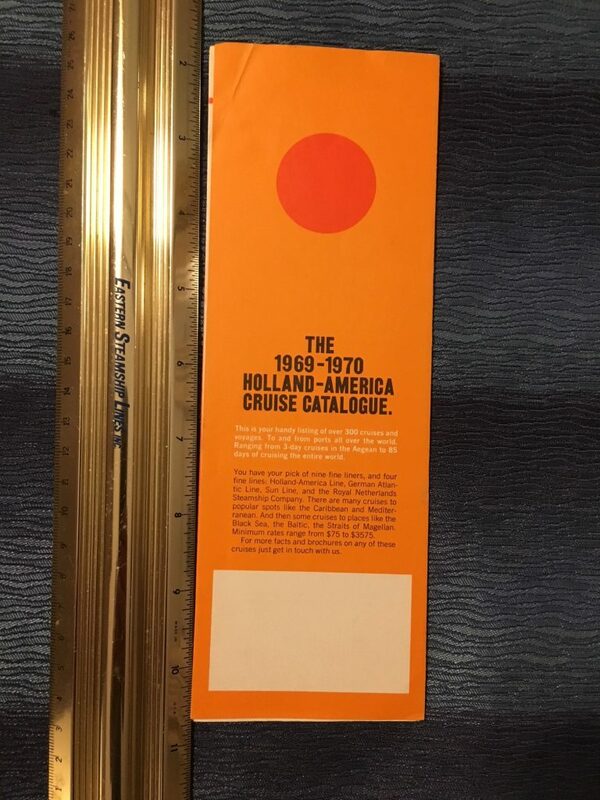 Super on board directory for the Famous Holland American Flagship Rotterdam. 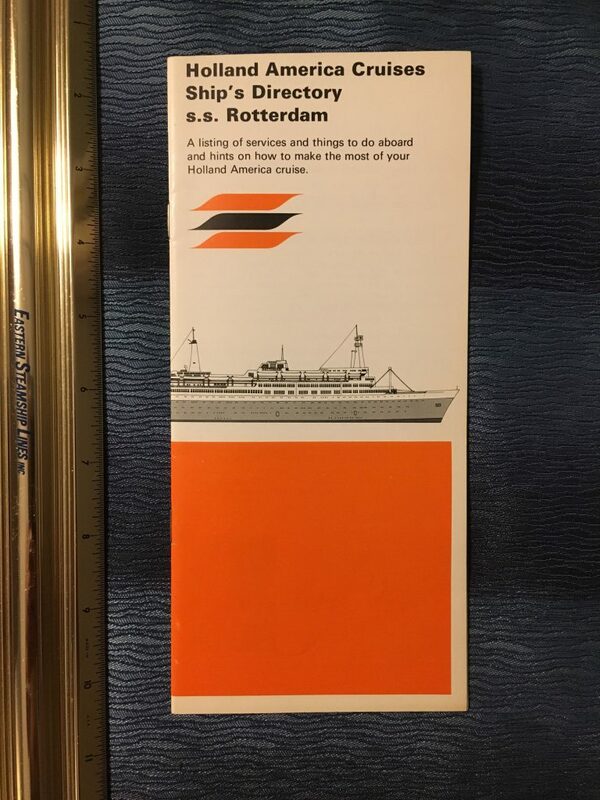 Excellent condition and even includes some history of all the Rotterdam’s in the fleet. 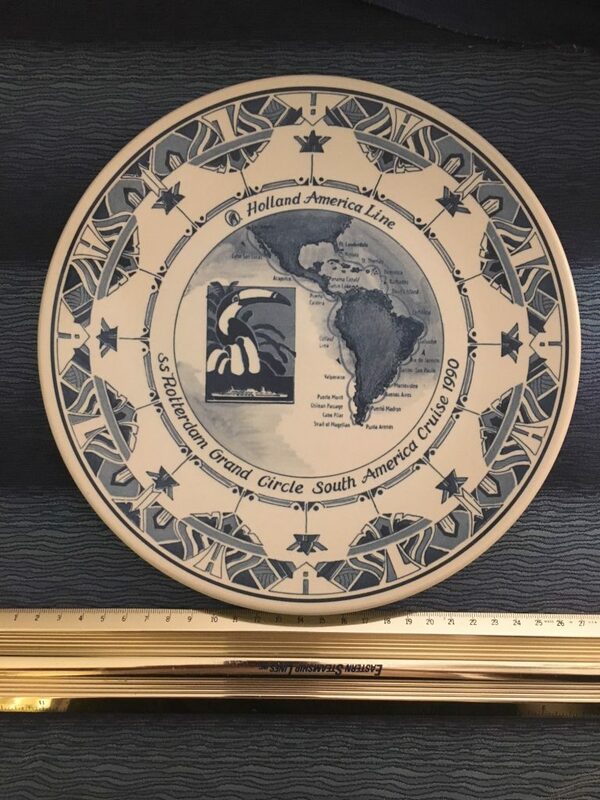 Great set of 16 unique snapshots for the lovely sisters that were once the Moore McCormack pair Argentina and Brasil. They had very long lives under many names. 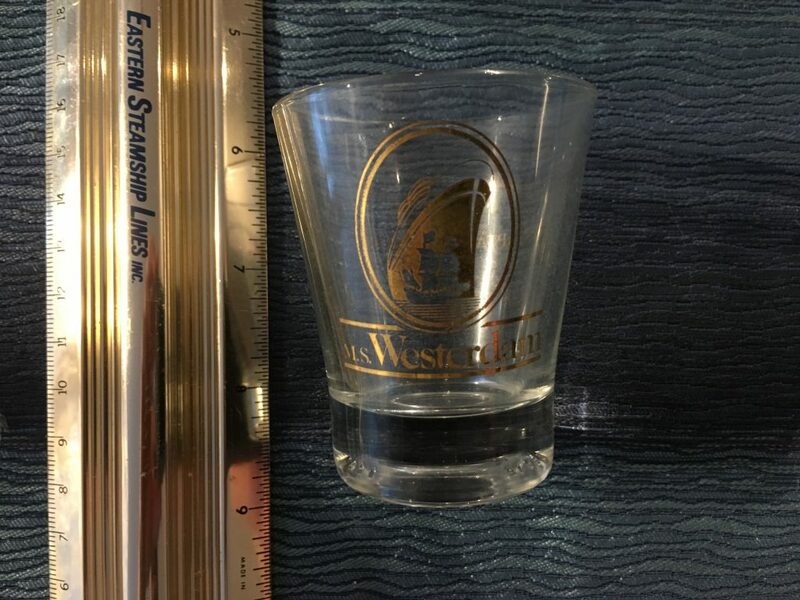 These appear to be from the later 1980’s. 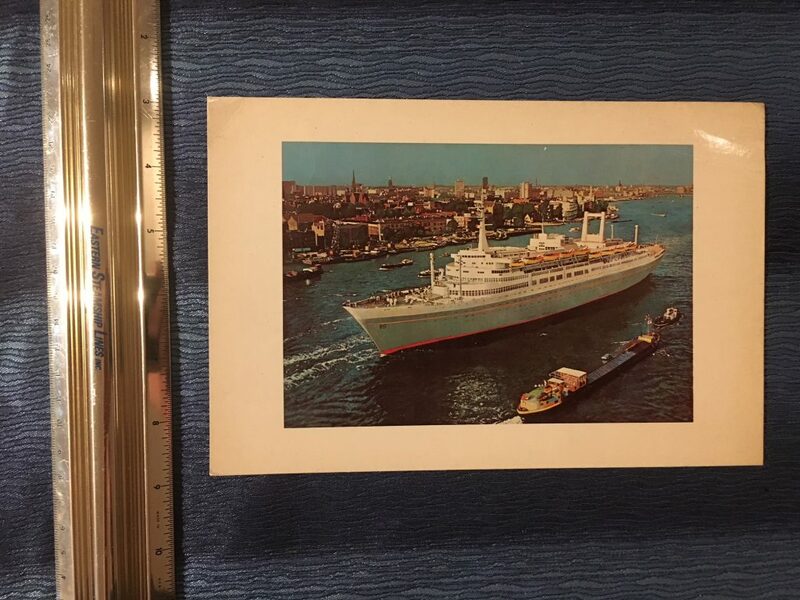 Lovely Image of the superb Rotterdam in her namesake harbor. 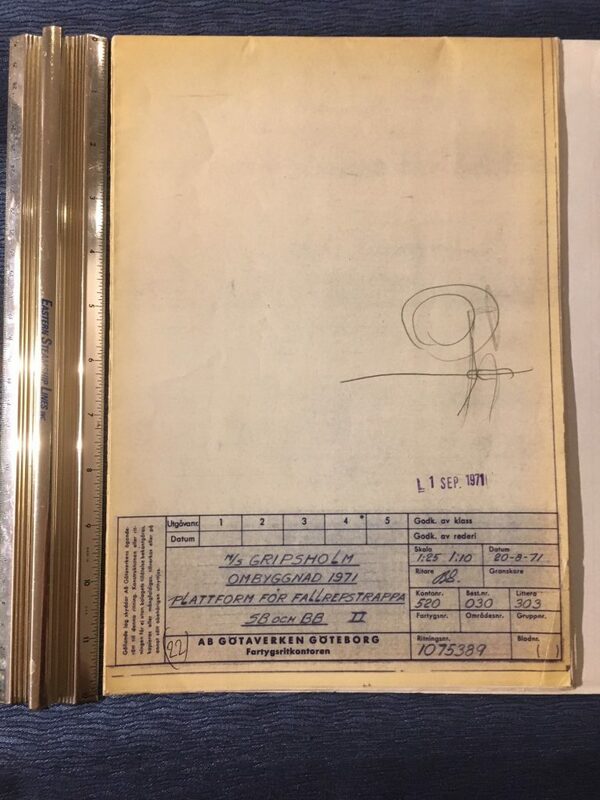 The is a little bend to the upper corner. 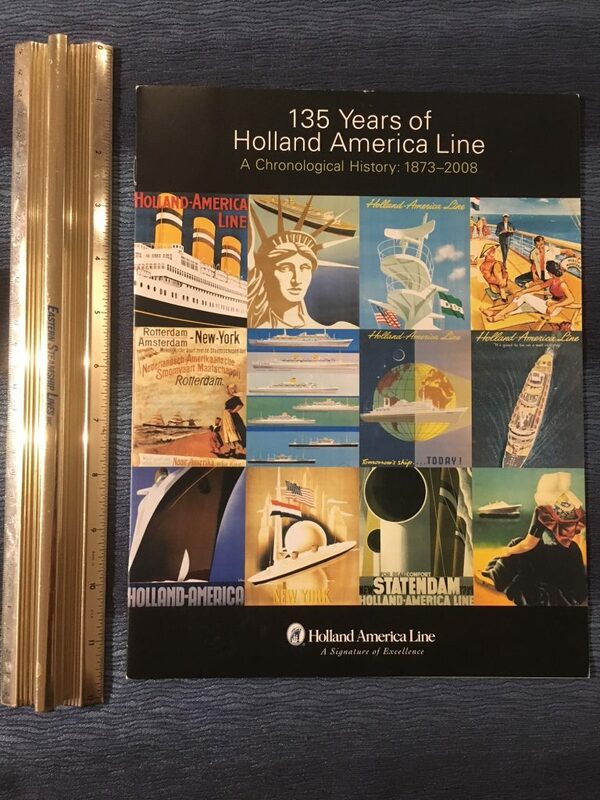 Titled a chronological History 1873-2008 this is packed with historical information for HAL services. 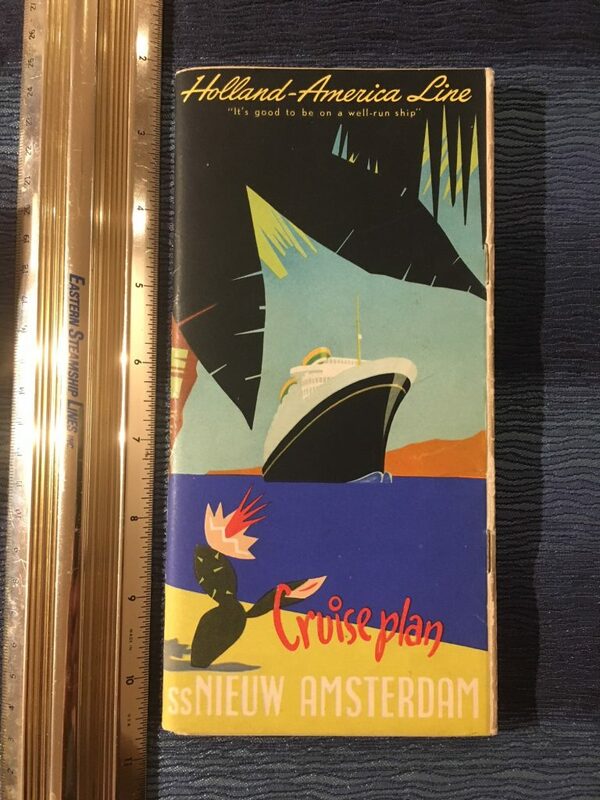 The cover includes lovely advertising poster artwork from the 30s through the early 60’s. 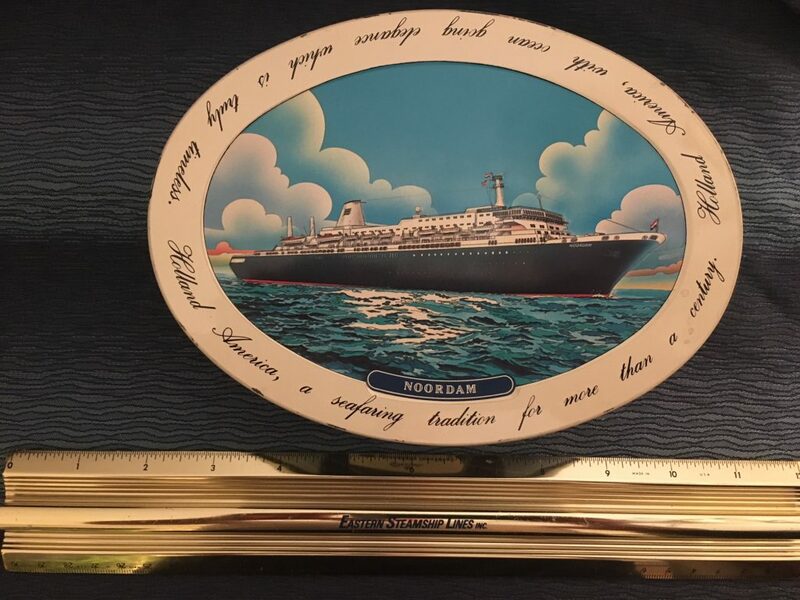 The back cover has an artist impression of the newbuilding Eurodam. 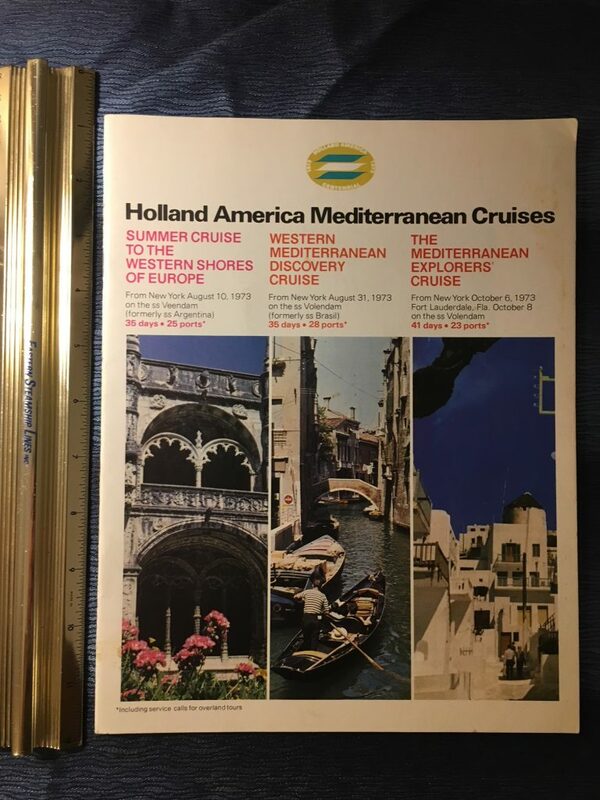 HAL Marketing really put some extra efforts into their cruise plans in the 50’s … as compared with other shipping lines. 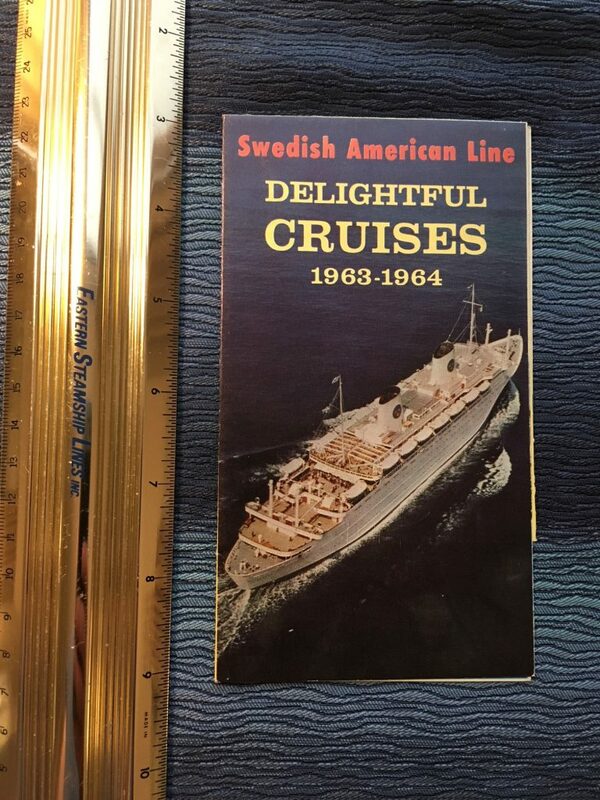 These deck by deck layouts offer full color plans as well as color photos of interiors and activities aboard. 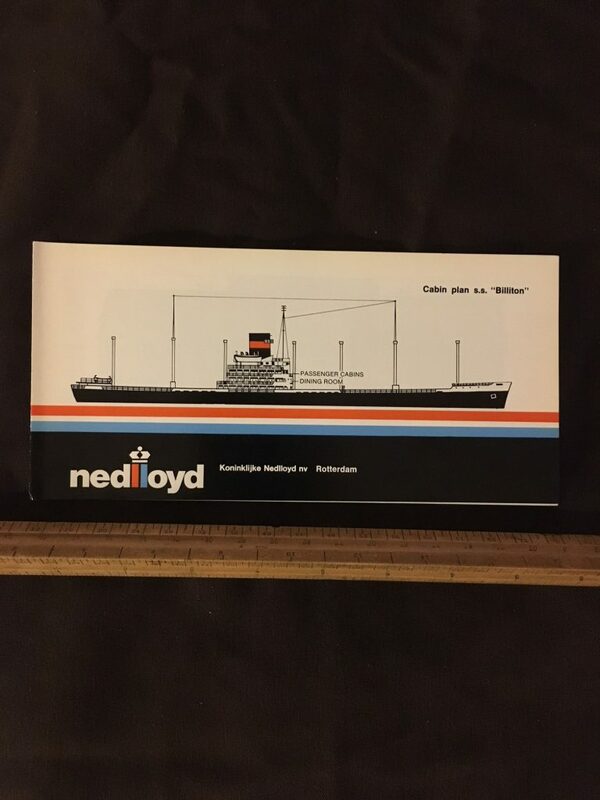 Printed on high quality heavy stock paper with excellent cover graphics. 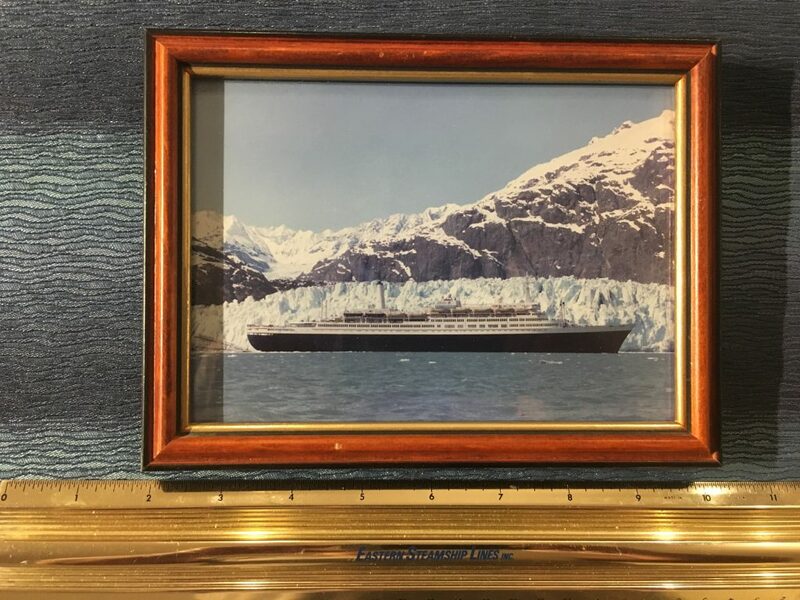 A great 4x6ish framed picture of the amazing Rotterdam Sailing past an Alaskan Glacier. 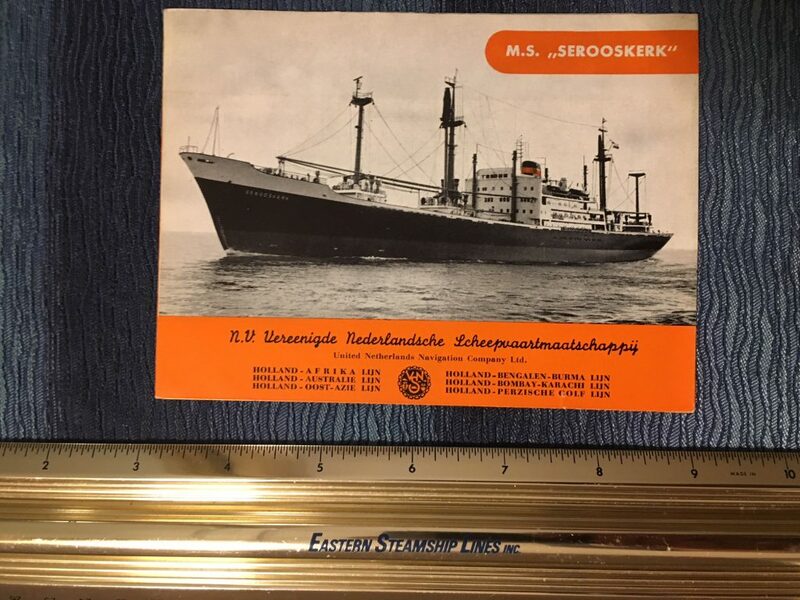 You can visit her today in Rotterdam harbor. 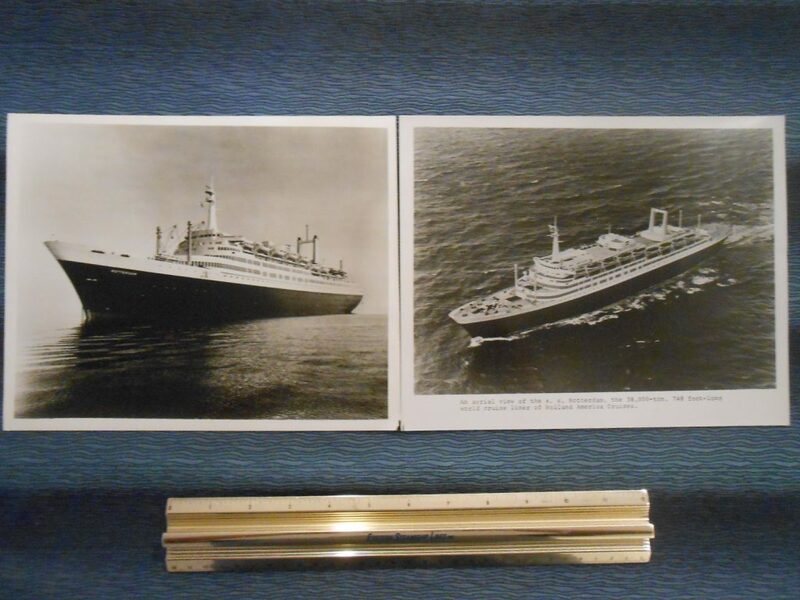 2 lovely exterior views of one of the most beautiful ships ever built. I spent an amazing day onboard her in 2014. 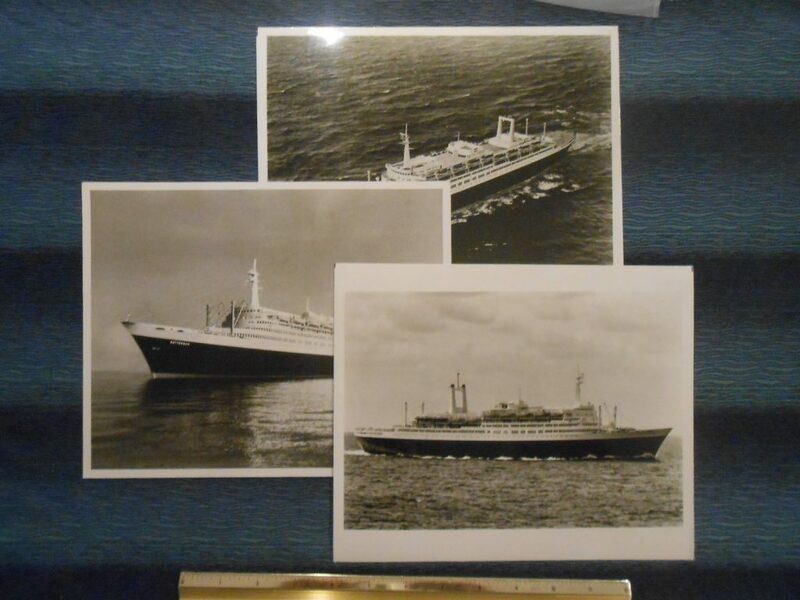 3 lovely exterior views of one of the most beautiful ships ever built.